We have all your corporate requirements covered. Work with us to create exactly what you need, whether it be a simple, easy to use online service, a fully managed 360 degree feedback intervention or something in between. For any project it’s important to have tools which are fast and simple to use. Even more so with larger projects where large numbers of responses are being gathered from a lot of different people. During the operational phase effective tools can significantly reduce the overall manhours that go into gathering responses and easy project setup reduces the workload on your HR team too. We’ve designed a system mindful of the fact that most users have never seen it before and they don’t want to be ploughing through pages of instructions or calling you for help. Tools to manage overall project status quickly and easily. Equally important is that the system outputs are easy to access and simple to understand by the end user – that they lead the user easily to the right messages and are highly transparent without over processing the data in ways which are misleading or hard to defend. Learn more about our feedback reports. End of project reports to support organisational learning and directed development activity following 360 feedback. our optional analysis tools will help you identify strengths and weaknesses within your organisation and provide you with supporting evidence when designing your development interventions. And – equally important – can provide you with longitudinal data that will justify the ROI of your L&D programme. Appraisal360 have invested heavily in developing powerful purpose built tools that you can use with confidence. The system is hosted on dedicated Enterprise level servers with off site backup facilities and is hosted a high security European data centre. It uses an industrial strength Cisco firewall, we log every login attempt and use a real time email validation system. The system is managed and developed by our own internal software development and technical support. We are career IT and telecoms professionals and when you log into your Appraisal360 account you’re going to be using the most robust and easy to use 360 degree feedback system around. Your team aren’t going to be struggling to use some badly designed system and ringing you up every five minutes asking what to do next. On the rare occasion someone does need some help we have this covered to with our free email and telephone support desk. If you have developed your own company competency frameworks, have different competency profiles for the different job roles in your company or want to run 360 feedback for specialised programmes within your company then you may be interested in our bespoke questionnaire capabilities. 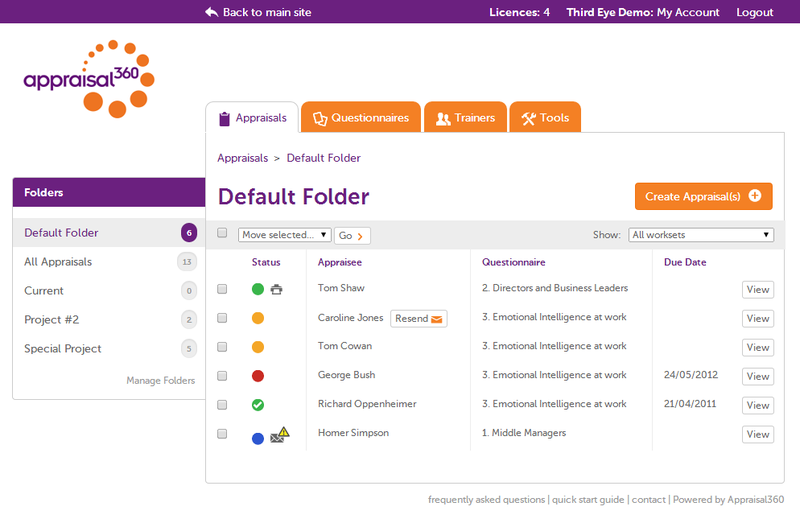 Our exclusive Competency Profiler Tool allows you to build up your own libraries of competencies and then build them rapidly into feedback questionnaires. This allows you to mix & match from our extensive competency library or use your own. Adapt your organisation’s competency framework or work with one or our experienced practitioners to start from scratch. For customers who have smaller numbers of questionnaires or who prefer us to take on this role for them we are happy to upload single questionnaires to their own specification. If corporate branding is important you have the flexibility to brand reports, or choose a fully branded website – powered by us – which lets you deliver seamless 360 degree feedback with your own corporate look and feel. Feedback reports branded to your requirements. Learn more and see some live examples. If you prefer to have your 360° feedback intervention managed and facilitated externally then we can do that for you too. At the entry level we can take on the administration of the data capture part of the project right up to a fully managed project we we handle everything including the feedback sessions and organisational learning aspects. Getting the best from 360° feedback normally involves some kind of one-to-one or group discussion with those receiving the feedback. We can arrange for one of our practitioners to facilitiate this for you and help draw out any organisational learning points. If you would prefer your own people to be trained and equipped to handle the delivery of feedback to your employees we can offer facilitation training to suit your needs. This could be by sending some of your people on one of our open training events or for larger customers we can provide bespoke training events at your premises. Online and face to face training is available for all aspects of your 360 project. Appraisal360 practitioners are experienced coaches and consultants who can support your project end to end, either with specific aspects such as facilitating the feedback or manage the entire project on your behalf. Through our Practitioner Network we can find the right resources for you.